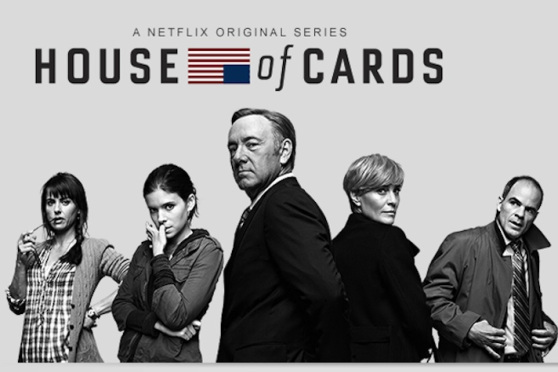 Netflix released "House of Cards" with Kevin Spacey on Friday and when it did, it released all 13 episodes. Binge viewing may transform more than our personal grooming habits, as Fred and Carrie discovered in a “Portlandia” episode when they plowed through a few seasons of “Battlestar Galactica” without leaving the house. Community members will have to exhibit proper etiquette...Imagine reading the wrap-up on Episode 1 of 'The Wire' and seeing a screenshot from Episode 12 (spoiler alert!)." More than anything, the debut — all 13 episodes — of Netflix’s “House of Cards” raises questions about what the binge viewing approach to programming will mean for TV as we know it. For those who haven’t experienced binge viewing, it’s what happens when you have an entire season of TV shows on DVDs or a streaming service and can watch as many episodes as you want. If this sort of programming — releasing entire seasons at once — becomes popular, what will have to change? Everything. The way we talk about what we watch, the way we share, the way reviewers critique shows, and even the ad model — everything will have to change. And, how will the virtual water cooler change for these sorts of shows? Will the changes we saw with time-shifting become exacerbated? Even with asynchronous viewing on older shows, you could go back and see what the blogs had to say — in a fairly structured way — about a given episode. The episodic structure allowed the community to break down each show each week. If you were a few days behind it was relatively easy to jump into the conversation when the time was right. What does a TV critic such as Entertainment Weekly’s Ken Tucker do now? Review all episodes this weekend? Pace them out weekly? So far I see first-episode reviews and commentary (Tucker reviewed the first two episodes), but only a few instances of binge reviewing. AV Club is doing once-per-week reviews, after releasing reviews of the first two chapters on day one. I am glad Netflix has such laser focus on programming and quality of experience, but I think there are more features and interactivity they could offer users than just 1990s-style user-generated ratings and reviews. It doesn’t appear that Netflix is focused on anything but programming. The company even mothballed its friends/social functionality from a few years back. And the “second screen” apps that are out there seem to be focused either on discovery (such as NextGuide) or a light experience (such as Flingo). Netflix has an opportunity to move beyond just search and discovery, and to evolve past the static episode reviews you see on the site today. Similarly, existing TV communities will have an opportunity to change the way they talk about programming. Bloggers and entrepreneurs will have to up their game from doing weekly reviews that fit their current style of publishing. There is an opportunity to embrace binge viewing as part of the Netflix suite of products, or better yet for third parties to embrace the new viewer experience. Ty Ahmad-Taylor, head of Smart TV Services for Samsung, backed me up on that. “I think that the opportunities for the social vector around shows that are viewed exclusively on an on-demand basis are woefully under-exploited,” Ahmad-Taylor told me via email. “If you look at SoundCloud, for example, their synced annotations for each song posted on the service help drive shared moments for listeners, regardless of when they listen. Community 3.0. A media-friendly experience that blurs the line between editor and commenter. Gawker’s Kinja platform is a good start. But I’d like to be able to follow reviewers/commenters that I like within a given show, and across the network as a whole. Social hubs. Aggregation of social sentiment and content across each episode. We are starting to see this with event programming such as the Super Bowl. Spoiler prevention. Community members will have to exhibit proper etiquette. Misbehavior will get you banned or blocked. Imagine reading the wrap-up on Episode 1 of “The Wire” and seeing a screenshot from Episode 12 (spoiler alert!). Clip sharing. Hulu-inspired clip sharing would support the viral nature of community. “Arrested Development” will present the next great opportunity to evolve this new style of programming. Not only will all episodes be released at the same time, but there apparently will be no predefined sequence to the shows. How will the community talk about a self-described puzzle? We shall see. Eric Elia is President of Cainkade, a leading user experience design and development firm based in New York and San Francisco. He joined Cainkade in 2012 after over 10 years as a pioneer in the online video space. Most recently, he was part of the founding team at Brightcove where he first oversaw product design, then founded and ran the in-house consulting business. Previously, he led the design, development and strategy for the Comcast online service. Follow Eric on Twitter @ericelia.